This is my blog. I plan on using it primarily for gaming related news and updates, with a smattering of editorials, rants and whatever else I deem necessary to post here. 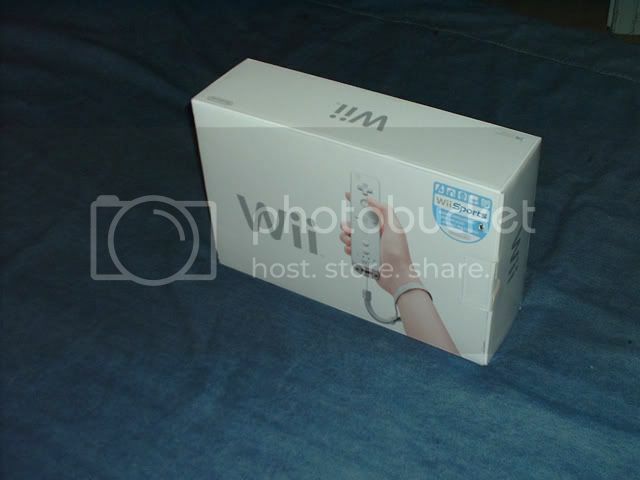 On November 19, 2006, the Nintendo Wii console was officially made available to the public. I had my console preordered at my local GameStop, so I didn’t make a fuss about rushing out to pick mine up when the store opened. At around 2 PM that day, I made my way up to the store and finally picked up my Wii console. Excitement rushed through me as the clerk went into the back room and brought out the small white box containing the object at the root of much excitement and anticipation over the past few months. The Wii remote itself is everything I remember from my experiences with it before. In hand, it’s one of the most comfortable controllers I’ve ever used. It’s got a good feel to it in terms of balance and weight, and it fits naturally in your hand. The nunchuck attachment is incredibly light (almost to the point of feeling a bit cheap) but is well designed, and is comfortable for long playing sessions. I also noticed the analog stick is a bit smaller than the one found on the Gamecube’s controller, but that’s neither here nor there. The only gripe I have regarding the Wii remote is the speaker. The sound quality just isn’t that good. The sounds are tinny and lack the clarity you’d find from most good quality headphones or speakers you’d find today. The Wii console’s interface is well designed and is easy to work around. Flipping through the Wii “channels” is oddly reminiscent (in a good way) of flipping through channels on a television. Due to the similarities (at least in a physical sense) between the Wii remote and a traditional television remote, the channel interface was probably intentional. It’s simple, it’s easy, and very intuitive. After playing my share of Wii Sports (the only game I have at the moment), I have to say that I am very pleased with how this game turned out. It’s pretty much every thing I expected and more. If you recall, I had a chance to play it last September at the Nintendo Fusion Tour event. After that small taste of Wii Sports, I was itching to play more. Wii boxing and Wii bowling are easily my two favorite modes, and boxing is great fun with a friend (but then again, all these games are great with a friend). So far, the Wii has lived up to my expectations. I’ve had a ton of fun with it so far, and the only way I can go is up. I’ll be picking up some additional games soon and I’ll post my impressions on those as I get them. Has the novelty of actually swinging my arm (or flicking my wrist) to control my games worn off yet? No, not yet. In time, it probably will. It’s up to developers to come up with innovative and exciting ways to use the Wii remote’s motion sensing capabilities to keep the gameplay fresh and keep gamers and non gamers alike coming back for more. It’s certainly got me intrigued. I feel like making another blog post, so here's what's on my mind at 10:19 AM as I sit in the Library to kill time between classes. Gears of War has lived up to my expectations and in many ways, exceeded them. The game is just awesome on so many levels. The singleplayer game is great but what really takes the cake is the multiplayer. It's so satisfying and fun. Unlike Halo 2, where people just run at each other guns a blazing, Gears of War actually requires teamwork and effective use of cover. You can't just run off and do your own thing. If you do, you'll likely end up overwhelmed by the other team. I love it. It's not the deepest game ever, but its fun and rewarding. Nothing beats sneaking up on someone and taking a chainsaw to them or gibbing an opponent with the Gnasher Shotgun. I could go on and on, but I won't. It would take far too long. Trust me, if you have an Xbox 360, get this game. Odds are, you won't be disappointed. The Playstation 3 and Wii will be launching soon and I will be in line on launch day for one of them. Can you guess which one? I'll give you a hint. It starts with a "W" and ends with a...well, I think I've made it easy enough. The PS3 is looking better and better the more I hear from it, but it's not five or six hundred dollar worthy yet. I'm waiting until it gets a few more games I'm interested in before I take that plunge. Resistance seems to be getting rave reviews though, and since I love FPS games, that'll likely be my first purchase when I do pick up a PS3. The Wii on the other hand has me extremely excited. I can't wait to play some more of Wii Sports and Red Steel. Super Monkey Ball Banana Blitz seems to be getting some good reviews as well so I might end up picking that up at launch too. Okay, looks like it's just about time for me to be heading off. I'll be back later with more updates on Gears and the impending launches of the Wii and PS3. Gears of War, the single most hyped and hotly anticipated game on the Xbox 360 to date. It’s been called a number of things, ranging from “The next Halo” to “The reason to buy an Xbox 360 this fall”. Who could blame people for generating such a buzz? Apparently, there is much to be praised, from the excellent graphics (probably the best you’ll see this year, on any platform), to the exciting tactically based “stop and pop” gameplay, Gears of War seems to have the total package. Well, I guess I’ll know soon enough, as I’ll be picking up my copy of the game around 3 PM Tuesday. As the months passed, drawing ever closer to the release date, my anticipation grew exponentially. The previews that have popped up in nearly every gaming related periodical or website I’ve seen. It’s pretty amazing. One preview in particular that got me the most excited was the 14 page spread (not counting the advertisements thrown in on just about every other page) in the November 2006 issue of Electronic Gaming Monthly. It revealed a lot about the game that I had previously been unaware of (the curb stomp in particular) and clarified some things I had been confused about. It left me with a newfound interest in the game, one that has only grown since then. Since reading that preview, I actively sought out any and all Gears of War information and media on the net, and found my fair share. I stumbled upon some videos of Gears of War multiplayer (which have subsequently been removed for some reason but were uploaded again by users) on GameTrailers.com. Videos Four and six are my current favorites of the 12 or so that were once up there. An almost ten minute video preview over at Gamevideos.com made by the 1up crew, also has my interest through the roof, particularly because they discuss just how fun the game is and how all their worries about the game becoming repetitive have been put to rest. One of the speakers said something that really got me going. “This is probably the most polished game Epic has ever put out.” Wow. That’s certainly saying something, considering the Unreal Tournament series that has received pretty much rave reviews across the board. There's also the "Mad World" TV spot that popped up on the Xbox Live Marketplace a few weeks ago which managed to whet my appetite for all things Gears of War, if only for a short while. Well, that’s my two cents regarding this massively hyped game for the Xbox 360. If my preorder turns out to be good, I might have a video of my initial impressions up soon (possibly Thursday or Friday). Well, if I can manage to tear myself away from the game long enough to set up and shoot the video. My name is Justin McBride and I’m a guy who enjoys writing, playing games and writing about playing games. Sound lame enough yet? Well, I have other interests as well such as hanging out with friends, watching TV, going to the movies from time to time, surfing the internet, listen to good music, drive at speeds I shouldn’t be driving at and so on. The problem is, that’s all stuff everyone likes to do, so why write about it? Oh wait, seems I just did. Oops.